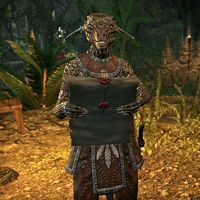 Dradeiva is an Argonian who can be found camped outside the Tsofeer Cavern. She has been researching an ancestor of hers who is reviled as a traitor for serving as a scout for the Imperial Ninth Legion during their invasion of Murkmire. Dradeiva has tracked his last known location to to the Tsofeer Cavern where the whole legion disappeared. Dradeiva hopes to find out what happened to him and hopefully restore his reputation but has heard rumors about the malevolent Wuju-Ka that lives within the cave, so she is looking for some assistance. Unusually for an Argonian, she has a deep interest in history, seeing it as something to be learned from. "Dryskin! Didn't I see you talking with the explorers from Cyrodilic Collections? Are you one of them? Would you be willing to help me with a crucial and sacred task?" "I have suffered shame for the actions of my ancestor. When the Imperial Ninth Legion marched into Murkmire, my distant relative agreed to serve as their scout, and ever since my egg-family has carried the mark of traitors. I want to erase that mark." How do we clear your egg-family's name? "After my egg-relative joined them, the Legion vanished. At long last, I believe I know where they disappeared to—Tsofeer Cavern. However, the cavern is rumored to be the home of the Wuju-Ka. I can't face that monster on my own. Will you go with me?" I'll help you explore Tsofeer Cavern. When you have agreed to help her and she has joined you as a companion, she can be asked more questions. "My egg-siblings only care about the here and now. But I always believed that history was the key to exonerating our disgraced ancestor. I know we'll find something in the cavern, I just know it! As long as the Wuju-Ka doesn't object to our presence." "There have always been dark legends surrounding the Tsofeer Caverns, stories about a monster called the Wuju-Ka. It is some sort of powerful voriplasm, a massive pool of malignant slime that was said to periodically emerge and cause untold damage." What are you hoping to find inside the caverns? "Evidence that the Ninth Legion visited the cavern before it disappeared. Maybe even signs that the Imperials entered Tsofeer and never emerged. If we could locate something that explains why my ancestor agreed to help them, that would be moist!" What do you know about the Tsofeer Caverns? "The Tsofeer Caverns were sealed by a rock slide in the distant past. Recent tremors, however, have opened a path into the caves. I also learned that tribal elders once performed rituals to bind the Wuju-Ka inside, but that was a long time ago." Tell more more about the Lost Legion. "Many seasons ago, when the Imperials first sent troops to our beloved swamps, the Ninth Legion terrorized the region. It marched from one end of Murkmire to the other, inflicting death and destruction along the way. Why do you think Tsofeer Cavern holds the answers you seek? "I've gathered every song and story I could find that even mentioned the Lost Legion. After many seasons of travel and study, an obscure line in a ballad sung by an elder of the Gee-Rusleel tribe led me to Tsofeer. My burden lightens with every step!" Tell me more about your ancestor. "Gin-Rajul was a renowned scout, well-respected before the Imperials convinced him to help them. I'm certain they must have forced him. Threatened him in some way. No spawn of our eggs could have been a traitor! And with your help, I'll prove it." Once you enter the cave, you can find an abandoned imperial camp at the entrance as well as some surviving notes. Dradeiva: "That proves it! My ancestor and the Ninth Legion did visit this cave! Let's keep looking around." "Let me take a closer look. Gin-Rajul, that's my ancestor! And look, it mentions the Ninth Legion by name. This proves they visited this cave. We need to keep looking. There must be more clues as to what happened in here." Dradeiva: "More proof that the Ninth Legion and my ancestor explored these caves!" "Let me see that. This is a Ninth Legion officer's journal! It mentions my ancestor, Gin-Rajul. And how the Legionnaires started disappearing. It had to be the Wuju-Ka! It must have devoured the Imperials." When you find the resting place of the last legionnaire. Dradeiva: "Another note! What happened to the Legion becomes clearer and clearer." "Another note? It talks about the altar where the elders prepared the ritual to bind the Wuju-Ka. Hmm. I think my ancestor led the Imperials into this cavern and fed them to the Wuju-Ka! He saved our tribe, but made the voriplasm more powerful." Even further into the caverns another camp can be found as well as the dagger for the binding ritual. Dradeiva: "That's a ritual dagger! Probably the one used by the elders to perform the binding ritual. Now we need to find the altar." When spoken to Dradeiva will explain why she and you need to redo the binding ritual for the Wuju-Ka. "As long as the cavern was sealed, the Wuju-Ka was trapped. It couldn't spread across Murkmire. But now that the caves are open …. There's no one else my friend. We need to find the altar and perform the ritual to bind it to this cavern!" You know how to perform the binding ritual? "I tried to learn as much as I could when I came across the stories of the Wuju-Ka. I'm no expert, but with the dagger we found, I can replicate the ritual. I think. Let's go find the altar." 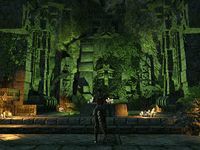 The Sacred Altar can be found near the ruins of ancient Argonian buildings which the Wuju-Ka flows through. Dradeiva: "That's the altar the elders used to prepare the rite of binding. I think I can duplicate the ritual, but I need you to do something first." Dradeiva can be spoken to find out what needs to be done. "From what we learned, my ancestor only pretended to help the Legion. He led them here to save Murkmire. When the Legionnaires sealed the cave, they interrupted the cycle. No one has come to bind the Wuju-Ka in centuries. I guess it's up to us." How do we bind the Wuju-Ka? "I will prepare the dagger and the sacred altar according to the stories the elders told me. In the meantime, I need you to weaken the Wuju-Ka. Only then can we perform the ritual." How do I weaken the Wuju-Ka? "The Wuju-Ka is a massive pool of voriplasm that interacts with the world through extensions of itself. The smaller voriplasms that prowl these caverns are all just part of a greater whole." A massive pool of evil slime that creates extensions of itself, got it. "According to the stories, the Wuju-Ka creates an extension of itself to guard the pool. Find this large voriplasm guardian and destroy it. That should weaken the Wuju-Ka and make it more susceptible to the binding ritual." What happens if we can't bind the Wuju-Ka? "The Wuju-Ka isn't like other voriplasms. It has an intelligence and a hunger different from the simple creatures seen in the swamp. Once it emerges from the cavern, it will spread and consume all of Murkmire. We can't allow that to happen!" Dradeiva: "I think that did it! Now climb the stairs and help me complete the ritual!" As you reach the Wuju-Ka's pool, you can watch Dradeiva perform the ritual. Dradeiva: "Malgai wih-jah veeka kai!" "Quickly now! Ignite the brazier!" Dradeiva: "The rite of binding is complete! Meet me outside and we can talk!" When you reunite with Dradeiva outside, she is jubilant and vindicated. "The journal and letters we found prove that the Lost Legion met its doom in Tsofeer Cavern. They also reveal that my ancestor led them there in order to protect Murkmire. And more importantly, we used the rite of binding to trap the Wuju-Ka!" How long will the rite of binding hold the Wuju-Ka? "For seasons and seasons, my friend! And I shall inform the elders of the nearest tribes. They will once again take up the responsibility of maintaining the ritual. I couldn't have accomplished any of these things without your help. Thank you!" You really think your ancestor led the Ninth Legion here on purpose? "I do, I do! He knew the tribes weren't strong enough to oppose the Ninth Legion, so he sacrificed his own life to lead them to the Wuju-Ka. I feel very proud to be part of his egg-family, my friend." So will this clear the traitor's mark from your egg-family? "Not only will this evidence restore the honor of my egg-family, our actions have helped save all of Murkmire. And I couldn't have done any of this without you! Please, accept this small gift as a token of my appreciation." After completing The Lost Legion, she can be asked about her future plans. "I can't wait to tell my egg-siblings all about our ancestor! They're going to be so proud!" "The binding will hold for awhile. In the meantime, I'll talk to the elders of the nearby tribes and make sure they restore the traditions of the past. As long as the elders periodically perform the rite of binding, the Wuju-Ka will remain contained." Any other secrets hiding in your egg-family's history? "Oh, most assuredly! I might even talk to Cyrodilic Collections. Since my people have little use for history, maybe the outsiders can teach me a few things. Anyway, may the rivers always flow in your direction, my friend!" Her journal can be found in her camp outside. This page was last modified on 29 December 2018, at 02:27.